Cast a Junk Removal Spell Today! Tom's Junk Collectors offers professional rubbish removal in London for your home or business including offices, shop centres, manufacturing plants, construction sites, and more. We are happy to help you with your rubbish removal needs. With a well-established transport system and local teams situated throughout entire London, we are able to provide to our customers flexible, efficient and cost-effective junk removal. You can rely on us for fast and reliable rubbish collection that can be scheduled in a wide variety of time slots. Our close proximity to your property also means that we can come and pick up your unwanted items on the same day of your call, within 2 hour frame. Weekend and evening collections: our services are available 24/7, which means we can come and collect your rubbish at any time suitable to you. A great range of discrete services: we can cater to any rubbish removal need you might have, from clearing domestic waste and garden debris to picking up building materials and commercial waste. 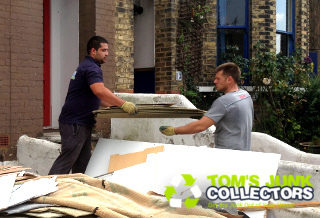 Getting reliable rubbish clearance in London can be a tricky task but not when you use Tom's Junk Collectors' services. We offer efficient and responsible service that allows clients easily to reach us and dispose of their junk in the most eco-friendly manner. Metals, e-waste, paper, clothing, furniture, appliances and office supplies will be taken to the nearest reuse and recycling centre where to be properly processed. To be honest, everyone. We have the capacity to fir in and remove all of your domestic clutter, or the production left overs of your business. Don't hasitate to give us a call if you are a commercial customer. Even better, we would love to propose for a long term relations business to business. Restoraunts, workshops, caffees, and all other kinds of local businesses are allready enjoying our rubbish collection services on a regular basis. No matter if you are a big or small client, Tom's Junk Collectors are here to take rubbish away! Don't waste time and money on a skip when you need junk removal in London, simply contact us on 020 3404 6996 and we'll be able to get started right away! Commercial and domestic rubbish removal services in London. We will lift, load and recycle your junk in a quick, safe and efficient manner. Find out more about us on ourwebsite! All of the team members have many years of rubbish removal experience, allowing them to tackle junk of all kinds, including electronic waste, with ease. Just let us know when you have items of a heavy or unusual nature and we'll think of the best possible way to get you rid of them. You can count on us for safe and efficient waste removal. Tom's Junk Collectors service is rated 4.81 / 5 based on 57 customer reviews! Contact us now - 020 3404 6996 - to bookrubbish removal in London with Tom's Junk Collectors. There's never a bad time to call because our cheerful customer advisers keep our lines, and the instant web chat facility of our online support service, open 24 hours a day, 7 days a week. You can get a quote on any combination of our great services throughout the week, or at the weekend. No matter when you choose to, there's no obligation. You can also reach Tom's Junk Collectors to schedule a rubbish collection through our online booking form. One of our customer care team will get back in touch with you right away. You can also find us on Google+ and Facebook - See the buttons on the right.